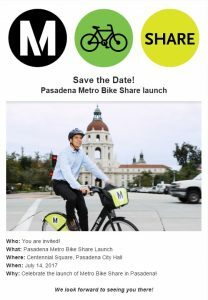 Metro Kicks off Pasadena Bike Share July 14th at 10 A.m.! Save the Date! Pasadena launches it’s new Metro Bike Share program in front of City Hall on Centennial Square July 14th at 10 a.m.! The Planning Department has been working on modifying the City’s existing accessory dwelling unit regulations, which was reviewed by the Planning Commission at its regular meeting on May 24, 2017. As a next step of the process, the City Council will consider the proposed amendment to revise the City’s existing Accessory Dwelling Unit Regulations at its regular meeting scheduled on Monday, June 19, 2017. The proposed Zoning Code amendments includes changes to the existing development standards applicable to new accessory... continue reading »"City Council Hearing on Accessory Dwelling Units Scheduled for 6/19"